John Wood and Paul Harrison have worked together in video since 1993, combining often humorous elements of performance and sculpture. They have widely exhibited nationally and internationally, including Centre Pompidou, Hayward Gallery and MOMA New York. 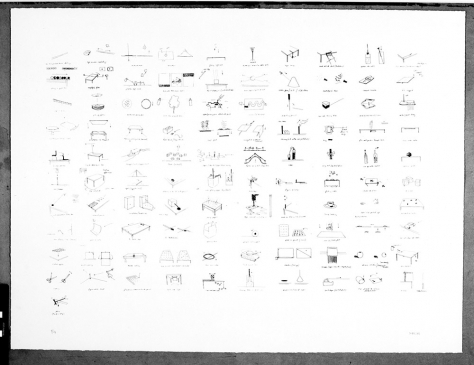 Working with the human body and other objects within a designated space, they document a number of experiments forming a set of diagrams or a coded language. 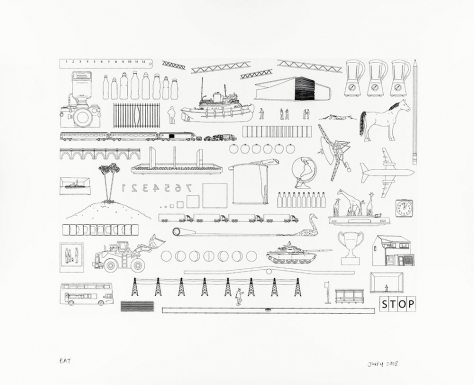 Their screenprint continues this theme, containing 101 drawings. Wood and Harrison are represented by London gallery f a projects.